Waterfront Accommodations - on the Water ! Why settle for a water view when you could be on the water ? Enjoy unique accommodations on a comfortably equipped 36 foot trawler. Located on the harbor at 213 Eastern Ave, 21403, in the Eastport section of Annapolis, within walking distance of historic downtown and the Naval Academy. 2 private cabins, 1 full bath, sleeps 4. Forward cabin has 2 twins that convert into a king. Aft cabin has a queen. Pullout sofa in the main salon is great for kids. The upper bridge deck provides 360 degree views with seating for 7, and the covered lower deck level features outdoor dining table. Fully equipped galley (kitchen) with gas oven and cook top, microwave, fridge and coffee maker. Additional bath house with showers is located at the base of the pier. 5 minute walk to several of Annapolis’ finest Resaurants and Pubs. 15 minutes drive to the Navy Stadium, 15 minutes drive to Rt 50. Annapolis is an Historic Town, home to the U.S. Naval Academy and the State Capitol. It is situated on the Western Shore of the Chesapeake Bay and is surrounded by scenic creeks and rivers. The shoreline is dotted with many picturesque estates and wonderful seafood restaurants. Many tours, cruises and charters are available downtown at City Dock. Sailing school located onsite. Why settle for waterfront housing when you can actually stay - on the water! The Sojourner is docked at the Chesapeake Boating Club marina. On- site is the renowned sailing school, JWorld. Additional bath house and showers located on shore. The Sojourner is docked at the Chesapeake Boating Club positioned at the JPort marina; home to the JWorld Performance Sailing School. Best views of the harbor !! Trawler was clean, comfortable, well equipped and staff were always available. I could sell it all and live on that trawler....really. It’s a boat, it’s small, it’s got character. Wonderful quiet place on the water. Stove and bathroom light didn’t work, they should have... hatch above the front berth leaked rainwater, downstairs berth has loud noises from the heater cycling on and off - kept people up. Staff was very nice. Your fun meter may be reliant on the weather you have. Great way to stay in the area. Away from the congestion, very quiet, easy walk to quite a few restaurants, yet close enough to inner harbor to see all of that. If you don’t want to fight the driving traffic, can take a water taxi over to the center of town. We spend 4 nights on this boat, and all worked out well. Staff was friendly and helpful, boat was well cared for, and showers on shore had unlimited hot water. Free convenient parking, a great neighborhood bar a block away, another breakfast cafe in the other direction...a very nice 4 days. Would repeat. We had a great time! Alex was very helpful and got us settled in quickly. What a relaxing weekend, enjoying the great views and peaceful setting. Would definitely stay here again. Great experience, first time overnight on the water! Everything was as described. The boating club people were great. 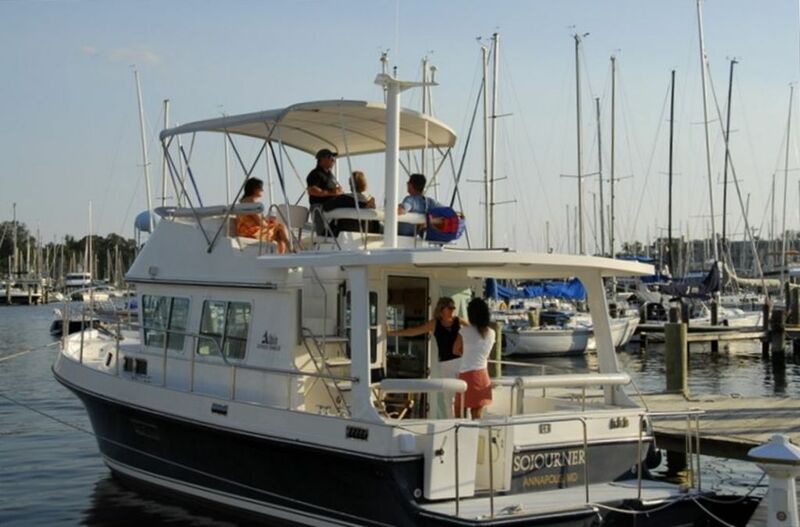 Eastport is a perfect location to see Annapolis and experience the Bay. Take a 2 hour sail on the 74' schooner 'Woodwind', Tour Annapolis harbor on the water taxis, or learn to sail at our on site sailing school, J/World.